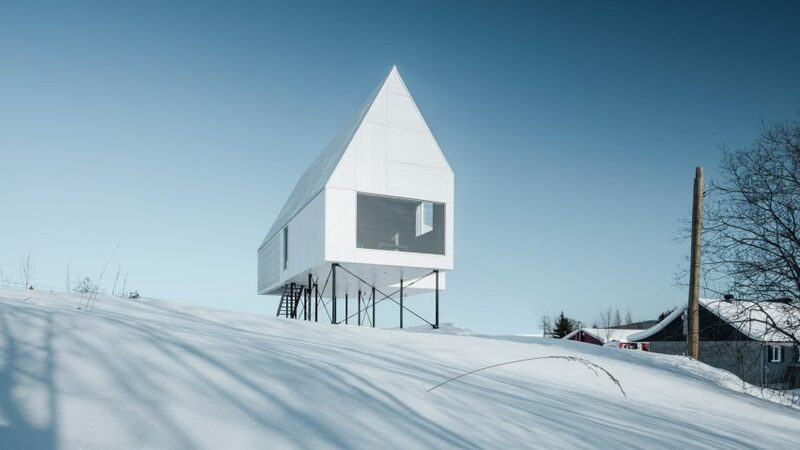 Stilts elevate this small winter cabin by Delordinaire above a snow-laden slope in Quebec, sheltering beneath its base an outdoor living space with a warming stove. Panels of white concrete and corrugated metal clad the external surfaces to create a crisp gabled outline, but inside the wooden substructure is left exposed to create warm-toned living spaces. Ample windows in the ends and flanks of the cabin, named High House after its stilted construction, ensure the interior is adequately lit all day long. The largest of the windows spans from the floor to the ceiling of the lounge to make the most of views to the slopes of Mont Sainte-Anne, a ski resort located around 40 kilometres from Quebec city. "Elevated stilt constructions are typically used in warm climates and flood zones," said Delordinaire founders Adrian Hunfalvay, Erwan Lêveque and Jean Philippe Parent. "This winter chalet uses the stilt typology to create a protected ground floor area with an outdoor stove, providing an unusual space where residents can be amongst nature and the snowy exterior, while still enjoying protection from the elements." This outdoor living space is loosely defined by the cross-bracing of the stilts, which are located around the perimeter of the building. Japanese studio Archi LAB employed a similar technique for a house in Asahikawa by raising the bulk of the building above ground level to create an extra living space that avoids snow build up during winter and creates shade in summer. The thin black legs of High House contrast with the white body of the building, giving it a striking appearance against the snowy winter landscape. "On a cloudy, snowy day, the house blends into the white landscape, almost disappearing, and on a summer day the minimal white structure cuts a clear form against the surrounding green hills," said the architects. A narrow black staircase leads up from the outdoor living space through a translucent well into the modest interior, which contains a pair of bedrooms, a bathroom and an open-plan lounge and kitchen. The roofline changes angle at one side of the house to accommodate the two bedrooms, which are located side by side and jut out from the main body of the living space. The Paris-based studio was founded by Australian-born architect Hunfalvay, Lêveque from France and Parent from Canada. As well as its main base in France, the practice has a satellite office in Montreal, allowing the architects to take on projects in Europe and North America as well as Asia. Photography is by Olivier Blouin.